Join us for a conversation with students of African, African American, and West Indian descent to better understand the relationship that we share with each other. In doing so, we will explore the attributes that make us unique, as well as what makes us connected. 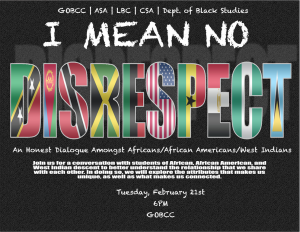 The event will be Tuesday, February 21st at 6pm here in the Gaines/Oldham Black Culture Center.